UPDATED: Thu., Nov. 15, 2018, 7:30 p.m.
SEATTLE – One year ago, I sat in Jerry Dipoto’s office and heard him gush about Lorena Martin and her impeccable credentials. For more than half an hour, he detailed how the Mariners were going to revolutionize the methods of keeping baseball players healthy and getting the most out of them, all masterminded by what he termed the “wildly overqualified” Martin. It seemed a match made in heaven. Who could have guessed it would end with one of the nastiest divorces I’ve seen in baseball? Martin was fired Oct. 10. On Monday, a little more than a month later, she went scorched-earth, taking to social media to blast the Mariners – specifically Dipoto, manager Scott Servais and director of player development Andy McKay – with shocking allegations of racist and sexist comments. All were strongly denied by the Mariners. I can’t overstate what a damaging blow this is to an organization already facing public distrust over its ability to build winning baseball teams after 17 years out of the playoffs, the longest drought in professional sports. Just 3 1/2 months ago, The Seattle Times detailed how three top executives, one of whom was later promoted to team president, were accused by women of inappropriate workplace conduct, resulting in the complainants receiving financial settlements. In other words, this is an organization that seems to be in constant turmoil, and this just adds to the perception of disarray. MLB has announced it will investigate Martin’s allegations, as it should. The charges are so serious that a neutral party is needed to sort through them, and the Mariners’ denials. But I’ve also heard there is disgruntlement with Dipoto and his management style in some quarters of the Mariners’ organization. I’m also wary of the tendency to smear the whistle-blowers in cases such as this. It seems clear to me that Martin in many ways was set up to fail. The scope of Dipoto’s vision for her job was so grandiose that it’s hard to imagine anyone pulling it off – particularly someone not familiar with the unique traditions and mores of the baseball world. To put such a person ostensibly with power over Servais and McKay was a recipe for trouble, if not the disaster that has ensued. If it sounds like I’m torn, that’s because I am. Martin told the Tacoma News-Tribune that Dipoto called her “a cocky Latina”; that Servais told her you don’t see Latino managers or catchers in baseball because “they aren’t bright enough. They are dumb”; and that McKay commented in a meeting that Dominican players are “just plain stupid.” If these allegations are true, then none should be working for a major-league team. If they’re not true, then Dipoto, Servais and McKay have been done a grave injustice. As tempting as it is to give a “hot take,” we must let this play out. The Mariners say they have a witness who will confirm in at least one instance that Martin’s claims didn’t happen as she said. 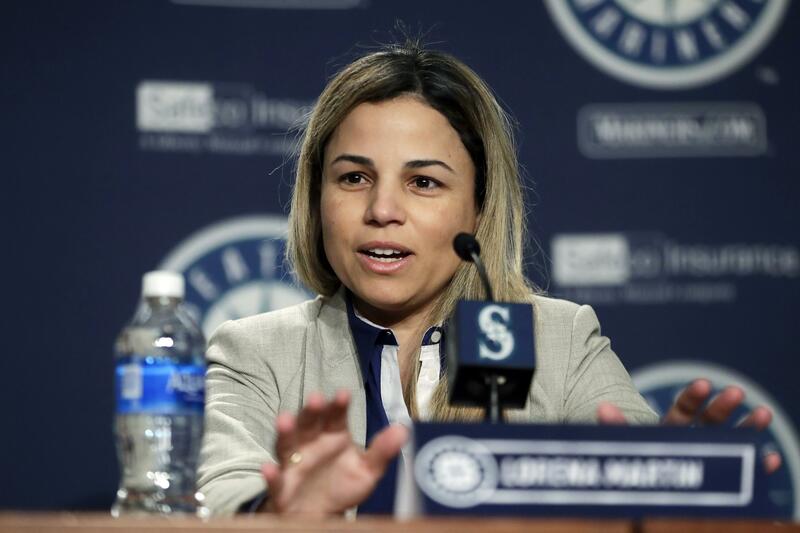 Martin told The Athletic’s Ken Rosenthal she possesses emails proving the Mariners breached her contract, and that she knows Mariners employees who are willing to speak on her behalf. In other words, it’s incredibly heated, contentious, bitter and muddled, as most contested divorces are. My observation has been that the Mariners as an organization has been welcoming to Latino players during Dipoto’s tenure running baseball operations. Servais has a deep background in Latin America, employs a Dominican native (Manny Acta) as his bench coach and has worked hard to forge positive relationships with Hispanic stars such as Robinson Cano and Nelson Cruz, both of whom he visits each winter in the Dominican Republic. But I also don’t know what goes on behind closed doors. No one does. That’s what makes this story so frustrating and so sad. And why it’s so hard to be a Mariners fan these days. Either they’re guilty of horribly backward views, or (less grave but still troubling) botching the instillation of an important and celebrated new aspect of team-building. No matter how it’s resolved, the stain from this episode will cling to the organization for a long time. Published: Nov. 15, 2018, 2 p.m. Updated: Nov. 15, 2018, 7:30 p.m.